No there isn’t. Once you have a list of leads, you have to determine whether or not the deceased owned real property. In my area I use the tax assessor’s site. In other areas folks look on the appraiser’s site. If you have your real estate license there is often a link right on the MLS for finding this information. The bottom line is you need to find out if there is any property in the estate. Putting together a list of solid leads takes some time, but it is where the gold is. Direct mail doesn’t work for getting probate leads. I just talked to someone that had sent out about 100 letters two months in a row, and she is off to try something else. She said direct mail doesn’t work for probates. There are two reasons why she hasn’t gotten any leads so far. First of all, 100 mail pieces just isn’t enough. I know sending out 1000 mail pieces each month is a big commitment. So the next question is; does it really have to be a thousand pieces every month? What if you just can’t afford to send that many out that many? Then send out as many as you can but send them every month, because the key is to mail regularly. You need to mail monthly. The other thing to consider is that the better your list is, the more likely you will get a higher return on your direct mail. What that means is that you will get more calls from a mailing if you have a better list. Once you get your first deal, put the money into ramping up your marketing. Remember that about 85% of your deals will come at or beyond your 5th mailing. I talked to 5 people and they all said they wanted retail. Well sure they did. If you could get a full retail sale for your property wouldn’t that be what you would want? Here’s the thing; when you get someone on the phone and you ask them what they want for the property they will most likely tell you what their best case scenario would be. You can’t let that stop you from continuing the conversation. When they tell you what they are hoping for, that is only part 1 of the conversation. Part 2 is when you start asking them about the condition of the property and why they need to sell. You want to find out two things; what their motivation is, and what the condition of the property is. Those two pieces of information will give you some negotiating power. Once you have this information, you will be in position to move forward and begin the process of changing their expectations. This is a process and you will get better at doing this over time. Remember this; folks that have inherited a house only want one thing. They want the cash that’s sitting in the house. They almost never want the property. Your job is to offer them a hassle free solution that solves their problem; one that turns the house into cash in their pocket. There is always a lot of junk in those houses, and I am not messing with that! I love it when houses are “crammed full of crap”. The more the better when the property itself is good. When you get a lead on a property especially when it is early in the probate process, if it is crammed full of furniture and junk you have a much better chance of putting a deal together. Who wants to deal with that? Pretty much no one and certainly not someone that has recently lost a loved one! Remember that as a real estate professional, you are not a clean out person or a hauler. You are an entrepreneur that happens to own a real estate investing business. You hire out those types of jobs. If you are a wholesaler, you have two choices. You can hire someone to clean out the house before you show it to your investor buyer, or you can do what I do and that is to let your end buyer hire it out. I figure out how much it will cost to clean out the house and just include that in my repair estimates for my buyer before I ever make my offer to the seller. Sellers that are facing the enormous task of cleaning out all of that stuff will often be ready to jump on your offer if you include cleaning out the house. You are solving problem for the seller that is most likely keeping them from moving forward. I have given you 5 reasons to hate probate investing, but the truth of the matter is I love probates. 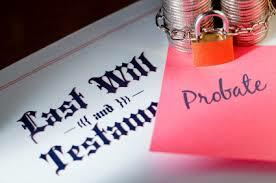 Probate investing is a very lucrative niche, but there is work involved. Figuring out how to get the leads in your area will likely take a little detective work. Don’t expect to just call up a successful investor in your area and have them hand you the keys to the kingdom. It’s not going to happen. Join your local REIA; get to know those folks and they will be much more likely to help you out with some of your questions. Once you have your leads, marketing to them consistently and following up with the sellers is the key to success. If you're not already subscribed to the blog”, be sure to do that today so you don’t miss any of the business building tips I have coming your way. I want this year to be your best year ever! And if you enjoyed this article, please share it.